Author(s) Ashok, S.; Chevallier, J.; Sumino, K.; Sopori, B. L.; Götz, W.
The evolution of semiconductor devices of progressively higher performance has generally followed improved material quality with ever fewer defect concentrations. However, a shift in focus over the years has brought the realization that complete elimination of defects in semiconductors during growth and processing is neither desirable nor necessary. It is expected that the future role of defects in semiconductors will be one of control - in density, properties, spatial location, and perhaps even temporal variation during the operating lifetime of the device. This book explores the effective use of defect control at various facets of technology and widely different semiconductor materials systems. 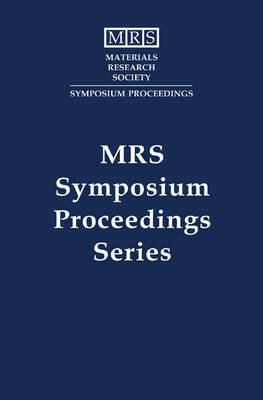 Topics include: grown-in defects in bulk crystals; doping issues; grown-in defects in thin films; doping and defect issues in wide-gap semiconductors; process-induced defects and gettering; defect properties, reactions, activation and passivation; ion implantation and irradiation effects; defects in devices and interfaces; plasma processing; defect characterization; and interfaces, quantum wells and superlattices.